The Nationals announced that they’ve acquired left-handed reliever Marc Rzepczynski and cash considerations from the A’s in exchange for minor league infielder Max Schrock. Rzepczynski (nicknamed “Scrabble,” for Nationals fans looking for an easier moniker for their new bullpen arm) currently has a 3.00 ERA, a 37-to-24 K/BB ratio and an exceptional 69.5 percent ground-ball rate in 36 innings for Oakland thus far in 2016. That 6.0 BB/9 rate isn’t quite as troubling as it may look, either, as six of Rzepczynski’s 24 walks on the season have been intentional. Control has never been a strong suit for him, however, as he’s averaged four walks per nine innings throughout his career. The 30-year-old Rzepczynski will give manager Dusty Baker a much-needed lefty in the bullpen, as an injury to Sammy Solis and the struggles of Oliver Perez have left the D.C. bullpen lacking in that regard. Rzepczynski has excelled against lefties throughout his career (.225/.295/.302) but has actually struggled against same-handed opponents this season, surrendering a .296/.360/.395 batting line. He’s been unusually effective against right-handed hitters, though, at least in terms of allowing extra-base hits. While his control issues have led to a .400 OBP for opposing righties, they’re also hitting just .226 with a .274 slugging percentage against him. A free agent at season’s end, Rzepczynski is earning $2.95MM this season, so the cash considerations heading to the Nats will help to offset some of the remaining $629K on his 2016 salary. In Schrock, the A’s will receive a 21-year-old that has enjoyed a terrific season at the plate in his first full professional season. Selected in the 13th round of last year’s draft, Schrock has batted .333/.378/.456 with nine homers, 31 doubles, two triples and 22 stolen bases in 543 plate appearances. Baseball America listed Schrock as a rising prospect in the Nats’ system back in July (subscription required and recommended), and he rated 17th among Nationals prospects on MLB.com’s midseason top 30 list, drawing praise for his bat speed, hand-eye coordination and ability to control the strike zone. Jonathan Mayo and Jim Callis call him a “pure hitter” in that scouting report but note that he is only “adequate” and also “erratic” at second base, with his lack of speed and questionable throwing arm making left field his only real fallback on the defensive spectrum. Defensive question marks aside, the Nationals look to have paid a fairly steep price for a six-week rental of Rzepczynski. However, given their current standing as the second-best team in the National League (73-53), trade options for the Nats were probably few and far between. Lefty relievers are always in demand, and the teams trailing the Nats in the standings of course have plenty of motivation to place claims on players with an intend to block the Nats, furthering complicating their road to acquiring bullpen help. The Rockies aren’t planning on moving Carlos Gonzalez or Charlie Blackmon, reports FanRag’s Jon Heyman. While CarGo is a perennial trade candidate, the Rockies’ excellent play since the All-Star break has the team back at .500 and within a stone’s throw of a Wild Card playoff berth. Whether the Rockies will actually remain in the hunt remains to be seen, especially as other clubs in the race move to fortify their rosters, but Colorado has looked impressive as of late and could always extract value in trades of Gonzalez and/or Blackmon in the offseason if the club falls shy this season and wishes to add more pitching to its minor league ranks over the winter. The Yankees are listening to offers on right fielder/designated hitter Carlos Beltran, tweets ESPN’s Buster Olney. However, executives from other clubs tell Olney that they consider the asking price on Beltran to be “beyond their reach.” As a free agent at season’s end, Beltran represents a logical trade candidate for the Yankees, who are walking a tightrope and trying to balance a desire to remain competitive in 2016 with a desire to build their farm system for the long haul. The Yankees have already traded both Aroldis Chapman and Andrew Miller, but they’ve also added righties Tyler Clippard and Adam Warren in an effort to keep the bullpen fairly stable. Beltran is hitting .301/.342/.538 with 21 homers on the season and is earning $15MM in the final season of a three-year, $45MM contract. He’s still owed about $5.34MM of that sum, and while his defense may cause some NL clubs to shy away, American League teams that can give him some occasional time at DH undoubtedly would be intrigued by adding the 39-year-old’s still-productive bat to their lineups. Pirates GM Neal Huntington said after yesterday’s trade of Mark Melancon that he’s still looking to add talent before the non-waiver deadline (Twitter link via MLB.com’s Adam Berry). Berry noted that the Bucs scouted the Rays and Yankees last night in a matchup of Drew Smyly vs. Nathan Eovaldi. Meanwhile, the Post-Gazette’s Bill Brink tweets that the Pirates asked the Braves about Julio Teheran but were told the right-hander isn’t moving. The Angels have received the most trade interest in right-hander Cam Bedrosian, tweets MLB Network’s Peter Gammons. However, Gammons implies that a Bedrosian trade isn’t likely, suggesting that the Halos view him as a future closer. The 24-year-old is in the midst of an incredible season, having pitched to a 0.92 ERA with a 48-to-11 K/BB ratio and a 50.5 percent ground-ball rate. He’s controllable through the 2021 season, so it’s understandable that the Angels would strongly prefer to hang onto him. Then again, elite relief arms are commanding strong results, and while Bedrosian doesn’t have the track record that Ken Giles brought into the offseason, it’s possible that the Halos could get some meaningful pitching talent to add to their system if they did market him. MLB Network’s Peter Gammons reported earlier this week that the Dodgers have asked the Athletics about a package including both Rich Hill and Josh Reddick, and now Ken Rosenthal of FOX Sports tweets that the Blue Jays have done the same. Toronto did acquire Melvin Upton Jr. earlier this week, potentially lessening the need for an outfield upgrade. But, Reddick would help to balance out a very right-handed lineup, and adding Hill to the mix would give the team a top-tier arm (if he can get healthy) to replace Aaron Sanchez if he is ultimately moved to the bullpen. The Indians held some interest in Athletics lefty Marc Rzepczynski as of last night, per Susan Slusser of the San Francisco Chronicle (on Twitter). Of course, Slusser’s report was prior to the Indians’ blockbuster acquisition of Andrew Miller, so it’s not entirely certain that they’ll be in the market for another lefty. However, they’ve regularly trotted out an entirely right-handed relief corps this season, so adding a more situational lefty like Rzepczynski to complement Miller, who dominates everyone and needn’t be limited to specialized matchups, makes some sense. The Padres and Brett Wallace have agreed to a one-year contract for the 2016 season, according to a team announcement. Wallace will earn $1MM next season, tweets MLB.com’s Corey Brock, placing him just shy of his $1.1MM projection. Backstop Chris Gimenez has agreed to a deal to avoid arbitration with the Rangers, per a team announcement. Gimenez will earn $975K while in the majors, but the deal is a split contract, Jeff Wilson of the Fort Worth Star-Telegram tweets. The Orioles announced that they’ve agreed to terms with outfielder Nolan Reimold on a one-year deal, thus avoiding arbitration. Rich Dubroff of CSNMidAtlantic.com reports that Reimold will land a $1.3MM salary (Twitter link). He cleared MLBTR’s projection by $400K. The Indians have avoided arbitration with newly acquired outfielder Collin Cowgill by agreeing to a $1MM salary for the upcoming 2016 season, tweets MLB.com’s Jordan Bastian. That’s an exact match with his projected salary. The Athletics announced that they’ve avoided arb with second baseman Eric Sogard, outfielder Sam Fuld, and newly acquired southpaw Marc Rzepczynski (Twitter link). Jeff Passan of Yahoo Sports first reported Sogard’s contract (via Twitter), adding that he receives a $1.5MM salary, which is a bit shy of his $1.7MM projection. The Cubs announced that they’ve avoided arbitration with lefty Clayton Richard, who, as MLB.com’s Carrie Muskat reports (on Twitter), will take home a $2MM salary next season. That’s a sizable increase over the $1.1MM at which he was projected. The Blue Jays have avoided arbitration with first baseman Justin Smoak, per Yahoo’s Jeff Passan (Twitter link). He’ll earn $3.9MM next season with the Jays. That number drastically outpaces the $2MM projected by MLBTR. Jose Lobaton and the Nationals have avoided arbitration by agreeing to a one-year deal worth $1.3875MM, reports James Wagner of the Washington Post (via Twitter). Lobaton’s deal comes in just shy of the $1.5MM he was projected to earn. The Phillies announced deals with infielder Andres Blanco and just-claimed outfielder Peter Bourjos. Yahoo’s Jeff Passan tweets that Bourjos will receive a $2MM salary and Blanco will be paid $1.45MM in 2016. MLBTR had projected Blanco at $1MM while Bourjos came with a projected tag of $1.8MM. Jordan Lyles has a $2.975MM deal with the Rockies, Jeff Passan of Yahoo Sports reports on Twitter. The righty will earn a minor bump over his $2.8MM projection. The Athletics announced that the team has agreed to a deal with lefty Felix Doubront on a contract for 2016. The value is not known at this time, but he was projected at $2.5MM. Backstop A.J. Ellis will receive $4.5MM next year with the Dodgers after striking a deal, Heyman tweets. That’s an exact match for the rate projected by MLBTR and Matt Swartz. The 34-year-old, who had a nice bounce-back campaign in 2015, will hit the open market after the coming season. Righty Vance Worley has signed on with the Orioles for $2.6MM, Jon Heyman of CBSSports.com tweets. That falls just $100K shy of his projected value as a first-year-eligible player. Baltimore added Worley earlier in the winter from the Pirates and figures to utilize him in a swingman capacity. The Cubs have agreed to a $1.42MM deal with just-added lefty Rex Brothers, Heyman tweets. Brothers was projected at $1.5MM and will land just south of that figure. Brothers was recently designated by the Rockies and then shipped to Chicago in a minor trade. And the Nationals will pay $900K to outfielder/first baseman Tyler Moore for the 2016 season, also per Heyman (via Twitter). He’ll land a bit shy of his $1MM projection, but the more relevant matter here is the fact that Moore will keep his roster spot. That has at times seemed at doubt, particularly with Ryan Zimmerman now entrenched at first base. 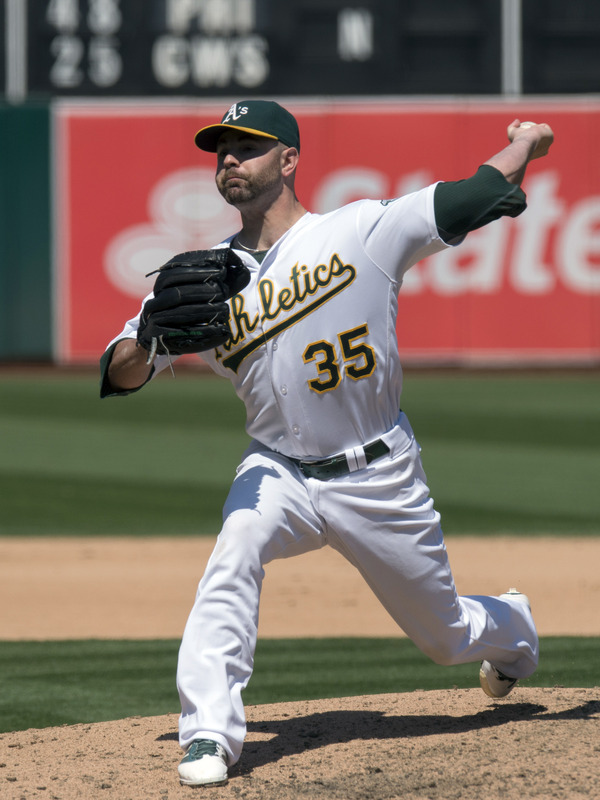 The Athletics and Padres have announced a deal that will send first baseman Yonder Alonso and southpaw reliever Mark Rzepczynski to Oakland in exchange for lefties Drew Pomeranz and Jose Torres. There’s also a player to be named later heading to San Diego. This deal is clearly motivated in large part by today’s non-tender deadline, as it involves several pieces with arbitration implications. MLBTR projects Alonso to earn $2.5MM in his second-to-last season of eligibility and Rzepczynski to take home $3MM in his pre-free agent campaign. Pomeranz, in turn, projects at $1.3MM as a first-year-eligible player. By adding Alonso, moreover, the A’s now seem all but certain to move on from fellow lefty-swinging first baseman Ike Davis, who is projected for a $3.8MM salary but will likely end up a free agent. Presumably, Alonso will pair with the right-handed-hitting Mark Canha in a first base platoon. 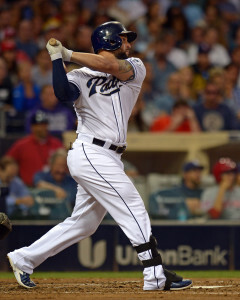 The 28-year-old Alonso has never quite lived up to expectations in San Diego, and the power has never really come around, but he does have excellent on-base abilities. He put up a .282/.361/.381 slash in 402 plate appearances last year. In Rzepczynski, meanwhile, Oakland adds another pen piece as the team continues to bolster its relief corps. The 30-year-old put up an unsightly 5.66 ERA last year, but that could well have been the product of some ill fortune, as reflected in a .381 BABIP-against and 25% HR/FB rate. He posted a strong 10.5 K/9 against 3.6 BB/9 while generating a ridiculous 67.3% groundball rate, and ERA estimators valued him as a much stronger contributor than the results suggested. On the Padres’ side of the deal, Pomeranz has emerged as a solid swingman option since coming to Oakland before the 2014 season. Last year, he tossed 86 innings (including nine starts) and posted a 3.66 ERA with 8.6 K/9 against 3.2 BB/9. Pomeranz was much more effective against lefties than righties last year, but he came up as a starter and could certainly be given a chance to operate from the rotation for San Diego. Though he did just undergo a shoulder procedure, the 27-year-old is reportedly expected to be ready to go when camp opens. Meanwhile, though the 22-year-old Torres only cracked the High-A level late last year, he was just added to the 40-man roster to protect him from the Rule 5 draft. Baseball America’s J.J. Cooper tweets that Torres works into the mid-nineties with his fastball and has made strides with controlling his secondary offering (a curve). ESPN.com’s Keith Law reported the major pieces of the deal on Twitter. Susan Slusser of the San Francisco Chronicle reported that the deal was done (via Twitter). Astros bench coach Trey Hillman has been the subject of rumors about him becoming the manager of the Yokohama BayStars in Japan, but he says he has not been in touch with them, Evan Drellich of the Houston Chronicle writes. If Hillman were to go to Japan, it would be more likely that he would return to the Nippon Ham Fighters, who he managed from 2003 through 2007 (although a move to that team doesn’t appear to be in the works right now, either). He does, however, remain open to possibilities outside the Astros organization. “It’s obviously not something that I’m politicking for,” says Hillman. Nonetheless, he adds, “I’m very happy being a Houston Astro, but if something jumps out I’m not going to snub my nose at it.” The Astros have Hillman under contract for 2016, so they would need to grant permission for another club to interview him. Here’s more from around the big leagues. The Indians need to add a bat this offseason, Paul Hoynes of the Northeast Ohio Media Group writes. He suggests that if the Indians were to trade a top starter like Danny Salazar or Carlos Carrasco (a possibility Nick Cafardo of the Boston Globe mentioned last week), they would likely want a capable big-leaguer and a good prospect in return. Hoynes does caution, however, that Salazar and Carrasco might not actually be on the market. Leaving aside the more significant Nick Swisher/Michael Bourn deal, the best of the Indians’ small trades last summer was sending Marc Rzepczynski to the Padres for outfielder Abraham Almonte, Terry Pluto of the Plain Dealer writes. Almonte hit well after the trade and earned praise for his defense in center field, and he’ll be back with the team last year. Meanwhile, Rzepczysnki struggled in San Diego, posting a 7.36 ERA despite striking out 17 batters in 14 2/3 innings. 8:42pm: The Mets are unlikely to work out a trade with the Padres for Rzepczynski, a source tells Newsdays’ Marc Carig. At this time, it’s unclear if that’s because the club landed an alternative. The acquisition of Addison Reed doesn’t necessarily affect the Mets interest in Rzepczynski since the latter reliever is a lefty specialist. 4:15pm: The Mets have claimed Padres lefty Marc Rzepczynski, Rosenthal tweets. It’s not yet clear exactly when they would need to complete a deal for him. Rzepczynski, who turns 30 today, has a 4.88 ERA with 10.7 K/9 and 3.9 BB/9 in 27 2/3 innings this year with Cleveland and San Diego. The Padres acquired him for Abraham Almonte at last month’s deadline. He’s making $2.4MM this season and will be eligible for arbitration again this winter. He might not be the only player they’re working on acquiring — Rubin tweets that the Mets have claimed a reliever from another NL team. 3:09pm: The Mets claimed the reliever from an NL team and are currently in discussions with that team, Rubin tweets. 2:07pm: The Mets have made a claim involving a reliever on revocable waivers and are waiting to see how it turns out, Ken Rosenthal of FOX Sports reports (Twitter links). It’s unclear whether the pitcher’s current team will pull him back from waivers or let him go, either by simply by allowing the waiver claim or by negotiating a trade. 1:34pm: The Mets are progressing on a move to add a reliever, ESPN New York’s Adam Rubin tweets. He emphasizes that a deal might not ultimately be consummated, but writes that the team is involved in real discussions. Earlier this week, it looked like the Mets might not be able to strike a deal, and GM Sandy Alderson had previously expressed pessimism about the possibility of making a trade. Now that a trade looks more likely, though, it seems likely the Mets are on the hunt for a lefty (although a righty certainly could also be a possibility). They’ve struggled to find a second consistent left-handed arm this season, and their current group of righties (Jeurys Familia, Tyler Clippard, Hansel Robles, Carlos Torres and Logan Verrett) has mostly performed well, despite the losses of Jenrry Mejia (to a suspension) and Bobby Parnell (to the disabled list). MLBTR’s list of players who have cleared revocable waivers doesn’t contain any lefty relievers, but that doesn’t mean there aren’t any available, since it isn’t always known to the public which players have cleared. It’s also possible the Mets could claim a player and work out a deal with his team. The Padres and Indians have agreed to a minor swap that will send lefty reliever Marc Rzepczynski to San Diego for outfielder Abraham Almonte, tweets ESPN’s Keith Law. Rzepczynski, better known as Scrabble, has pitched to a 4.43 ERA with 10.6 K/9 and 4.4 BB/9 this season. For his career, the 29 year old (30 later this month) has posted a 3.81 ERA with 8.4 K/9 and 3.9 BB/9 across seven seasons. Rzepczynski wasn’t mentioned much in trade speculation this month but the Padres apparently had their eye on him to bolster their bullpen. Almonte, 26, has appeared in 31 games for the Padres this season with a rather underwhelming slash line of .204/.271/.259. He has fared much better in 61 games for Triple-A El Paso, however, hitting .275/.361/.414. The Indians have avoided arbitration with third baseman Lonnie Chisenhall and agreed to a one-year, $2.25MM deal, CBS Sports’ Jon Heyman reports (Twitter link). It’s a slight bump over Chisenhall’s projected $2.2MM salary. Chisenhall hit .280/.343/.427 with 13 homers in 533 PA with the Tribe last season. The Indians and left-hander Marc Rzepczynski have agreed to a one-year, $2.4MM contract to avoid arbitration, according to Jon Paul Morosi of FOX Sports (Twitter link). Rzepczynski surpassed his projected salary with the contract, as he was pegged to earn $1.9MM next season. The southpaw posted a 2.74 ERA, 2.42 K/BB rate and an even 46 strikeouts over 46 innings out of Cleveland’s bullpen last season. The Nationals and catcher Jose Lobaton will avoid arbitration after agreeing to a deal, CSN Washington’s Mark Zuckerman reports. Lobaton will earn $1.2MM, FOX Sports’ Jon Paul Morosi tweets, which exactly matches his projected 2015 salary. Lobaton hit .234/.287/.304 over 230 PA in backup duty for the Nats last season. The Athletics and outfielder Craig Gentry agreed to a one-year, $1.6MM deal to avoid arbitration, FOX Sports’ Jon Paul Morosi tweets. Gentry was projected to earn $1.5MM. After posting a .759 OPS over 556 PA in 2012-13, Gentry took a step back at the plate last season, slashing just .254/.319/.289 over 258 plate appearances but still providing tremendous defense (a +16 UZR/150). The Nationals have avoided arbitration with second baseman Danny Espinosa, agreeing to a one-year, $1.8MM contract, James Wagner of the Washington Post reports. This deal falls below Espinosa’s projected $2.3MM contract, though Espinosa hit .219/.283/.351 in 364 plate appearances for the Nats last season and managed only a .465 OPS in 167 PA in 2013. The Indians agreed to a one-year, $2.337MM deal with right-hander Carlos Carrasco, according to Jon Heyman of CBS Sports (via Twitter). This figure is a significant increase over the $1.4MM contract that was projected for Carrasco in his first arb-eligible year. The righty enjoyed a breakout 2014 season, posting a 2.55 ERA, 9.4 K/9 and 4.83 K/BB rate over 134 innings with the Tribe. Carrasco pitched mostly out of the bullpen but also delivered several quality starts down the stretch. The Dodgers and outfielder Chris Heisey agreed to a one-year deal worth $2.16MM to avoid arbitration, CBS Sports’ Jon Heyman tweets. This is slightly less than the $2.2MM Heisey was projected to earn. Heisey is coming off a .222/.265/.378 slash line over 299 PA with the Reds last season and was dealt to L.A. last month. The Angels inked catcher Drew Butera to a one-year, $987.5K deal to avoid arbitration, Jeff Fletcher of the Orange County Register reports. Butera was projected to earn $900K next season. The catcher posted a .555 OPS in 192 PA with the Dodgers last season and was dealt to the Halos last month. The Nationals agreed to a one-year, $2.25MM contract with Craig Stammen, avoiding arbitration with the right-hander, CBS Sports’ Jon Heyman reports (via Twitter). This figure slightly tops Stammen’s projected $2.1MM contract. Stammen posted a 3.84 ERA, 6.9 K/9 and a 4.00 K/BB rate over 72 2/3 innings out of Washington’s bullpen last season. The Cardinals agreed to a one-year, $1.65MM deal with outfielder Peter Bourjos to avoid arbitration, Derrick Goold of the St. Louis Post-Dispatch reports. Bourjos was projected to earn $1.6MM. Bourjos displayed his usual top-shelf defense with the Cards last season but only hit .231/.294/.348 over 294 PA. The White Sox agreed to an arbitration-avoiding deal with right-hander Nate Jones, CSN Chicago’s Dan Hayes reports (Twitter link). Jones will earn $660K in 2015, slightly above his projected $600K salary. The righty only faced five batters last season (failing to record an out) and after undergoing Tommy John surgery in July, he’ll be sidelined for much of 2015 as well. The White Sox and right-hander Hector Noesi agreed to a one-year, $1.95MM deal to avoid arbitration, CBS Sports’ Jon Heyman tweets. Noesi was projected to earn $1.95MM. Noesi pitched 166 of his 172 1/3 innings in 2014 with Chicago, posting a 4.39 ERA in 28 games (27 of them starts) for the Pale Hose. The Angels have avoided arbitration with left-hander Cesar Ramos by agreeing to a one-year, $1.312MM contract, Mike DiGiovanna of the L.A. Times reports. This is just slightly above Ramos’ $1.3MM projected salary. The Angels and southpaw Hector Santiago have avoided arbitration by settling on a one-year, $2.29MM deal, MLB.com’s Alden Gonzalez reports (Twitter link). Santiago was projected to earn $2.2MM in the wake of a solid 2014 season that saw him post a 3.75 ERA over 127 1/3 IP. The Astros and Carlos Corporan have settled on a one-year, $975K deal to avoid arb, tweets Jon Heyman of CBS Sports. Corporan, who was recently linked to the Rangers as a trade target, had projected to earn $1MM. The 31-year-old batted .235/.302/.376 with six homers in 190 plate appearances for Houston last year. Ben Nicholson-Smith of Sportsnet reports (Twitter link) that the White Sox and Javy Guerra have settled on a one-year, $937.5K deal to avoid arbitration. That figure comes in below Guerra’s $1.3MM projection. The right-hander enjoyed a nice bounce-back campaign with the Sox in 2014, pitching to a 2.91 ERA with 7.4 K/9 and 3.9 BB/9 in 46 1/3 innings. The Nationals announced that they’ve avoided arbitration with Wilson Ramos, agreeing to a one-year deal for the 2015 season. Jon Heyman of CBS Sports tweets that Ramos will earn $3.55MM — slightly north of the $3.2MM projection from Swartz. The talented but injury-prone Ramos had a down year at the plate in 2014, batting .267/.299/.399 with 11 homers in 361 plate appearances. Southpaw James Russell and the Braves have avoided arb by agreeing to a one-year, $2.425MM contract, tweets Heyman. Russell, whom the Braves acquired along with Emilio Bonifacio from the Cubs at last year’s trade deadline, will earn just $25K more than Swartz’s $2.4MM projection. The 29-year-old posted a combined 2.97 ERA with 6.6 K/9 and 3.1 BB/9 in 57 2/3 innings between Chicago and Atlanta in 2014. Rangers VP of communications John Blake announced (on Twitter) that the club has avoided arbitration with right-hander Neftali Feliz by agreeing to a one-year deal. Feliz was projected to earn $4.1MM in 2015 after returning from Tommy John surgery to post a 1.99 ERA in 31 2/3 innings last season, and Jeff Wilson of the Fort Worth Star-Telegram tweets that Feliz will earn almost exactly that: a $4.125MM salary. Brett Cecil and the Blue Jays have avoided arbitration by settling on a one-year, $2.475MM pact, tweets Heyman. The 28-year-old Cecil has been excellent over the past two seasons in Toronto, pitching to a 2.76 ERA with 11.5 K/9 and 3.9 BB/9. He’s at times stepped up in the ninth inning as well, picking up six saves along the way. Cecil was projected to earn $2.6MM. The Cardinals announced that they’ve avoided arb with catcher Tony Cruz by agreeing to a one-year deal. Cruz, 28, batted .200/.270/.259 in 150 PAs with the Cards last season. He currently projects to be the club’s primary backup to Yadier Molina. Cruz, who was projected by MLBTR to earn $700K in arbitration, will earn $775K, tweets Heyman. The Cubs have avoided arbitration with lefty Felix Doubront by settling on a $1.925MM salary, Heyman tweets. Swartz had projected $1.3MM for the 27-year-old in his first time through the system, so his landing spot obviously represents a nice bump over that figure. Doubront came to Chicago last summer via trade after a rocky end to his time with the Red Sox. He made four generally productive starts for his new club, but figures to open 2015 in the pen while serving as rotation depth. We'll keep track of today's smaller deals to avoid arbitration in this post. Click here for background on the upcoming arbitration schedule and how MLBTR is covering it. You can also check in on our Arbitration Tracker and look at MLBTR contributor Matt Swartz's arbitration projections. After exchanging numbers, the Mets and pitcher Dillon Gee have agreed to settle at the midpoint of $3.625MM, tweets Adam Rubin of ESPNNewYork.com. Swartz projected Gee to earn $3.4MM. The Cubs have avoided arbitration with reliever Pedro Strop, president Theo Epstein told Mark Gonzales of the Chicago Tribune (Twitter link). He will earn $1.325MM next year, according to a tweet from Gordon Wittenmyer of the Chicago Sun-Times. It is not immediately apparent whether the deal was reached before the sides exchanged terms. The Angels have reached agreement on a $3.8MM deal with reliever Ernesto Frieri, reports Alden Gonzalez of MLB.com (on Twitter). Mike Minor has agreed to terms on a $3.85MM deal with the Braves to avoid arbitration, reports Mark Bowman of MLB.com (Twitter links). The deal came before figures were exchanged, Bowman notes. Chris Cotillo of MLB Daily Dish reports that the D-Backs and lefty Joe Thatcher have avoided arb with a one-year, $2.375MM deal (Twitter link). Nicholson-Smith tweets that the Angels and Fernando Salas reached an agreement to avoid arbitration. Salas is the first Halos player to avoid arb. Mike DiGiovanna of the L.A. Times tweets that Salas will earn $870K, which beats out his $700K projection. MLB.com's Jason Beck reports (via Twitter) that the Tigers and righty Al Alburquerque have reached agreement on a deal to avoid arb. The hard-throwing righty will earn $837.5K in 2014, tweets Beck. Sherman tweets that the Yankees and Ivan Nova avoided arbitration with a one-year, $3.3MM deal. The Pirates and Vin Mazzaro inked a one-year, $950K deal in lieu of an arbitration hearing, tweets Rob Biertempfel of the Pittsburgh Tribune. The Royals announced that they've avoided arbitration with infielder Emilio Bonifacio. Heyman tweets that Bonifacio will earn $3.5MM in 2014. Sherman reports that the Rays avoided arbitration with Jeremy Hellickson and Sean Rodriguez (Twitter link). Hellickson landed a $3.625MM payday with a $25K bonus if he hits 195 innings pitched. Rodriguez will get $1.475MM with a $25K bump for hitting 300 plate appearances. Roch Kubatko of MASNsports.com tweets that Brian Matusz avoided arb with the Orioles. Sherman adds that he'll earn $2.4MM in 2014. MLB.com's Brian McTaggart tweets that Jason Castro and the Astros have avoided arbitration. McTaggart adds in a second tweet that Jesus Guzman avoided arb as well. Heyman reports that Castro will be paid $2.45MM, while Sherman tweets that Guzman will make $1.3MM. The Indians tweeted that they've avoided arb with lefty Marc Rzepczynski, and MLB.com's Jordan Bastian tweets that he'll earn $1.375MM in 2014. Bastian adds that Scrabble will earn an additional $25K for appearing in 55 games and another $25K for 60 games. The Giants avoided arbitration with Yusmeiro Petit, according to MLBTR's Steve Adams (on Twitter). He'll earn $845K, according to Sportsnet's Ben Nicholson-Smith (via Twitter). Cesar Ramos got $750K from the Rays in his deal, Marc Topkin of the Tampa Bay Times tweets. Sherman tweets that the Athletics' Craig Gentry will get $1.145MM on a one-year deal to avoid arbitration. Jerry Blevins and the Nationals avoided arbitration, tweets Dan Kolko of MASNsports.com. He will earn $1.675MM for the year, tweets Ben Nicholson-Smith of Sportsnet.ca. Alejandro De Aza agreed to a $4.25MM deal with the White Sox, Sherman tweets. Within the same tweet, Sherman says the Rays shook hands with Jose Lobaton on a $900K deal and James Russell agreed to a $1.775MM pact. The White Sox and Gordon Beckham agreed to a one-year, $4.175MM deal, Sherman tweets. The Brewers avoided arbitration with Marco Estrada and Juan Francisco, Sherman tweets. Estrada gets $3.325MM with $100K in innings pitched bonuses while Francisco gets $1.35MM. Mike Dunn agreed to a $1.4MM deal with the Marlins, according to Juan C. Rodriguez of the Sun Sentinel (on Twitter). Pedro Alvarez will earn $4.25MM on his brand new deal with the Pirates, Sherman tweets. The Nationals announced that they've struck an arb-avoiding deal with Wilson Ramos. Ramos gets $2.095MM with the opportunity to get $105K more through plate appearance bonuses, per Sherman. Alexi Ogando gets $2.625MM in 2014 from the Rangers, according to Sherman. Mark Melancon will get $2.595MM after striking a deal with the Pirates, tweets Sherman. Brandon Moss and the Athletics avoided arbitration with a $4.1MM pact, Sherman tweets. The Red Sox and Jonathan Herrera avoided arbitration with a $1.3MM deal for 2014, Sherman tweets. Brian Duensing has agreed to a $2MM deal with the Twins, according to Mike Berardino of the Pioneer Press (via Twitter). Berardino adds in a second tweet that Anthony Swarzak also avoided arb with a $935K deal. The swingman will earn a $25K bonus if he starts 10 games. The Rangers and Neftali Feliz agreed to a $3MM deal with bonuses of $25K for 50/55 games finished, Sherman tweets. Jake McGee will earn $1.45MM in his new deal with the Rays, Sherman tweets. The Royals and Eric Hosmer have agreed to a one-year, $3.6MM deal, Sherman tweets. Mike Carp gets $1.4MM in his deal with the Red Sox, according to Sherman (via Twitter). Bobby Parnell agreed to a one-year, $3.7MM with the Mets that can increase by $50K if he appears in 60 games, Sherman tweets. The Braves avoided arbitration with Jordan Schafer with a $1.09MM deal, tweets Sherman. Sherman adds that Andy Dirks and the Tigers have also avoided arbitration with a $1.625MM deal. Shawn Kelley and the Yankees dodged arbitration by agreeing to a $1.765MM deal for 2014, Sherman tweets. Kelley, 29, has a career 3.77 ERA with 9.6 K/9 and 3.1 BB/9. The Red Sox agreed to a one-year, $1.275MM deal with Junichi Tazawa, according to Sherman (on Twitter). Tazawa posted a 3.16 ERA in 2013 with 9.5 K/9 and 1.6 BB/9. The Rockies avoided arbitration with Drew Stubbs by agreeing to a $4.1MM deal for 2014, according to Joel Sherman of the New York Post (on Twitter). With the signing of Stubbs, the Rockies have now taken care of all of their arbitration-eligible players. Kyle Blanks has avoided arbitration with the Padres by agreeing to a one-year, $988K deal, according to Jerry Crasnick of ESPN.com (via Twitter). Sherman also reports (on Twitter) that the Giants have avoided arbitration with Gregor Blanco and Tony Abreu by agreeing to one-year deals that are worth $2.525MM and $745K, respectively. The Cardinals and Peter Bourjos have avoided arbitration by agreeing to a one-year, $1.2MM contract, tweets Sherman. Bourjos can earn another $150K based on plate appearances. Gaby Sanchez and the Pirates have avoided arbitration with a one-year deal, according to Sanchez's agency, the Beverly Hills Sports Council (on Twitter). Jon Heyman of CBS Sports tweets that Sanchez will earn $2.3MM. Sherman reports (via Twitter) that the Blue Jays also avoided arbitration with Esmil Rogers by agreeing to a one-year, $1.85MM contract. The Nationals announced that in addition to their two-year deal with Jordan Zimmermann, they've also signed Drew Storen to a one-year deal to avoid arbitration. Sherman tweets that he'll earn $3.45MM in 2014 with an additional $1MM of incentives in his contract for games finished. The Rockies and righty Juan Nicasio avoided arbitration with a one-year, $2.025MM contract, Sherman tweets. The Blue Jays and lefty Brett Cecil have avoided arbitration with a one-year, $1.3MM pact, per Sherman (on Twitter). Sherman tweets that the Rays and Matt Joyce agreed to a one-year, $3.7MM contract, thereby avoiding arbitration. Ken Rosenthal of FOX Sports reports that the Reds have avoided arbitration with Alfredo Simon by agreeing to a one-year, $1.5MM contract (Twitter link). Connolly also reports that the Orioles have avoided arbitration with Tommy Hunter (Twitter link). Currently the front-runner to serve as Baltimore's closer in 2014, Hunter will earn $3MM after posting a 2.81 ERA with 7.1 K/9 and 1.5 BB/9 in 86 1/3 innings for the O's in 2013. Dan Connolly of the Baltimore Sun reports that the Orioles and Troy Patton have avoided arbitration (Twitter link). Patton topped Swartz's $1.2MM salary projection by earning a raise to $1.275MM, Connolly adds in a second tweet.. Patton will be suspended for the first 25 games of 2014 for amphetamine use. The Twins and Trevor Plouffe have agreed to a one-year, $2.35MM contract, Sherman tweets. Plouffe saw his power numbers drop as he batted .254/.309/.392 with 14 homers in a career-high 522 plate appearances in 2013 (he'd belted 24 homers in 465 PAs in 2012). He figures to open the season as Minnesota's everyday third baseman but could eventually have competition from top prospect Miguel Sano. Jon Jay and the Cardinals have avoided arbitration by agreeing to a one-year, $3.25MM contract, according to Sherman (on Twitter). Jay batted .276/.351/.370 with the Cards in 2013 but struggled defensively (particularly in the playoffs) and will have center field competition in the form of offseason acquisition Peter Bourjos in 2014. Joel Sherman of the New York Post tweets that the Phillies and John Mayberry Jr. have avoided arbitration by agreeing to a one-year deal worth $1.5875MM. Mayberry slashed .227/.286/.391 in 2013 and has a career .274/.321/.526 batting line against lefties. He came in just under Swartz's $1.7MM projection. The Cubs and Luis Valbuena have also avoided arbitration by agreeing to a one-year pact, tweets Sherman. Valbuena will earn $1.71MM after slashing .218/.331/.378 and setting a new career-best with 12 homers in 2013. He exceeded Swartz's projection by $210K. The Indians have announced the acquisition of left-hander Marc Rzepczynski from the Cardinals in exchange for minor league infielder Juan Herrera. Rzepczynski will report to Cleveland tonight, and a 40-man roster move will be made to accommodate the team's new addition. Rzepcynzski, 27, was optioned to Triple-A Memphis at the end of April after a rough start to the season. In Memphis, he posted a 3.33 ERA with 6.3 K/9 and 3.7 BB/9 in 44 innings of work — a significant improvement from the 7.84 ERA he's posted at the Major League level this season. Rzepcynski was recalled recently and has made a pair of July appearances for the Cardinals. Rzepcynski, whose nickname is "Scrabble" (for obvious reasons), has been effective against left-handed hitters throughout his career, holding them to a .224/.298/.310 batting line over parts of five big league seasons with the Blue Jays and Cardinals. St. Louis acquired him in the 2011 Colby Rasmus trade. He is earning just $1.1MM in 2013 and can be controlled via arbitration through the 2015 season. Cleveland GM Chris Antonetti said recently that his club has been on the lookout for bullpen arms that can retire left-handed hitters, and Rzepczynski fits that bill at a much lower cost than Javier Lopez and Josh Outman, both of whom also drew interest from Cleveland, according to ESPN's Buster Olney (Twitter link). Herrera, 20, is batting .275/.366/.369 in 39 games for short-season Class-A Mahoning Valley. The Dominican native did not rank among Cleveland's Top 30 prospects, according to Baseball America. Derrick Goold of the St. Louis Post-Dispatch was the first to report the agreement (on Twitter).